As far as I know this is the first discography to cover all of the Carter Family recordings both studio and radio. I have always been a fan of Country Radio and the historic recordings discovered by Ed Kahn from Station XERA have added another dimension to the Family’s musical heritage. If it encourages someone to try and discover more unpublished material I will be more than happy. 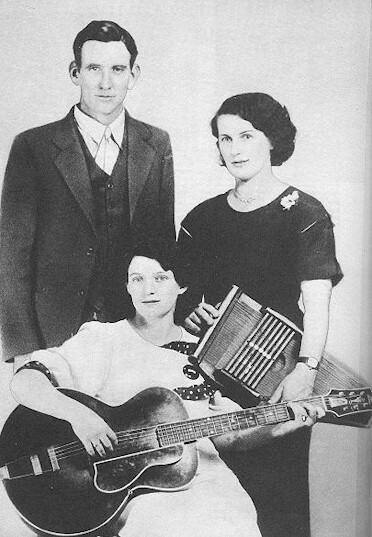 The Carter Family are justifiably called “The First Family of Country Music”. The “Family” consisted of A.P. his wife Sara and her cousin Maybelle who was married to A.P.’s older brother Ezra. A.P. Carter played the fiddle and guitar and had a strong bass voice. He never played an instrument on their studio recordings but on his solo performances on the radio he played a guitar and these show what a fine musician he was. However A.P.s main contribution to the group was as a writer and collector of songs. Sara played the autoharp and legend has it she was singing “Engine One Forty-Three” and playing the autoharp at the time she met A.P. Her voice was strong and pure and as Jonny Cash wrote “the beauty of the Appalachian dialect was never so enflowered as in the voice of Sara Carter”. Maybelle’s style of guitar playing was unique. What she did was play the melody on the bass strings while maintaining a rhythm on the treble strings. Later this style was to be imitated to the note by literally thousands of guitar players. Maybelle played more than the guitar she was also accomplished on the banjo and fiddle as well as the autoharp. She played the autoharp in a way it hadn’t been played before. Rather than strumming across the harp while barring a chord, Maybelle actually picked out the melody with her thumb and finger picks. On early hillbilly recordings the singers barely sang over the instruments. The Carter style was built around the vocals and they incorporated them into the instrumental background. In essence the Carter Family violated the main traditions of hillbilly music but in doing so created a whole new style and a whole new sound. Although A.P. and Sara separated in 1933 the Family continued to work together and then in 1938 they moved to Del Rio, Texas to work on Border Station XERA. The stations powerful transmitters brought their music to the ears of new fans right across the USA and sales of their records increased dramatically. However in 1942 the Family split up and went their separate ways, A.P. moved back to his beloved Clinch Mountains, Sara to California with her new husband and Maybelle and her daughters (Helen, June & Anita) began a new singing career which would lead eventually to seventeen years as regular members of the Grand Old Opry. Their lasting legacy was a hundred great songs, a standard for duet singing, and a guitar style that helped define country music. Music historian Tony Russell wrote “Whenever singers and pickers gather to play ‘Keep on the Sunny Side’ or ‘Can the Circle Be Unbroken’, Sara, Maybelle and A.P. are there, benign immortal spirits. There have been several discographies produced of the Carter Family’s studio recordings but the most extensive and the one I have used as my bible is Tony Russell’s Country Music Records - A Discography, 1921-1942. For details of the Transcription Discs collected by Ed Kahn I would like to record my grateful thanks to Jamie Vermillion of the Southern Folklife Collection at The University of North Carolina.